Remember that Google videogame console that rumors spread about last year? The thing exists. It’s real. Google announced it today, and it plays games. Yep. Stadia, as the device will be known, will stream games to pretty much every type of device with a screen. You’ll be able to play the same games on your TV, computer (both laptop and desktop), phones and tablets, without having to download individual games. There’ll even be a unique Stadia Controller that lets you play on devices that aren’t compatible with traditional gaming controllers, and you’ll be able to quickly and easily move between devices mid-game as needed. Google also owns YouTube, of course. 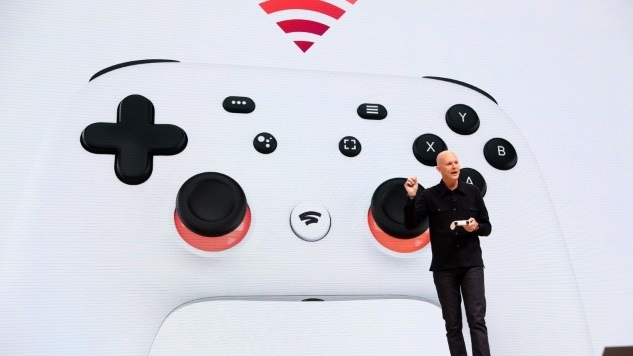 They’re promising lots of interactivity between Stadia and YouTube, with the ability to easily stream or share your gaming clips directly to that service. If you’re watching gaming videos from other people on YouTube, and like what you see, you’ll be able to press a button and instantly start playing that same game. You’ll also be able to find people to play with or against through YouTube. That’s presumably exciting news for fans and users of YouTube, although Google might want to straighten out that platform’s well-documented propensity for recommending videos full of lies, conspiracy theories and bigotry before inextricably wedding it to a gaming console. Obviously you’ll need a stable internet connection to play Stadia. America’s mediocre internet infrastructure might hinder the roll-out of Stadia throughout parts of the country. The benefit is that you won’t have to worry about the technology side of things. Everybody who plays through Stadia will be streaming their games through Google’s datacenters. That means you won’t have to buy a console or deal with the confusion of building or upgrading a gaming PC. Google hasn’t explained how payment will work with Stadia—if players will be paying per game or paying a subscription fee—but that will determine whether Stadia will be a bargain compared to paying for consoles or a PC, or if it will cost far more over the course of its life than the one-time expense of a new Xbox or PlayStation. In terms of games, Google announced that Doom Eternal will be available for Stadia, just as it will for every other current console. It’ll be running up to 4K with HDR and at 60 FPS, as it will on the other consoles. Google has also launched its own internal studio, Stadia Games and Entertainment, which is headed up by Jade Raymond, the former EA and Sony executive who helped create the Assassin’s Creed and Watch Dogs series while working for Ubisoft. Google says Stadia will be available at some point in 2019. You can check out its website now, and expect more news to be released at various events over the next few months. And if you want to check out Google’s announcement trailer, just click the button below already.